The description would have been removed and I would offer extra credit test points to the first person that could tell me what this picture represented. They came up with a lot of answers - the US, cities in the US, cell phone towers, Facebook users, and on and on. 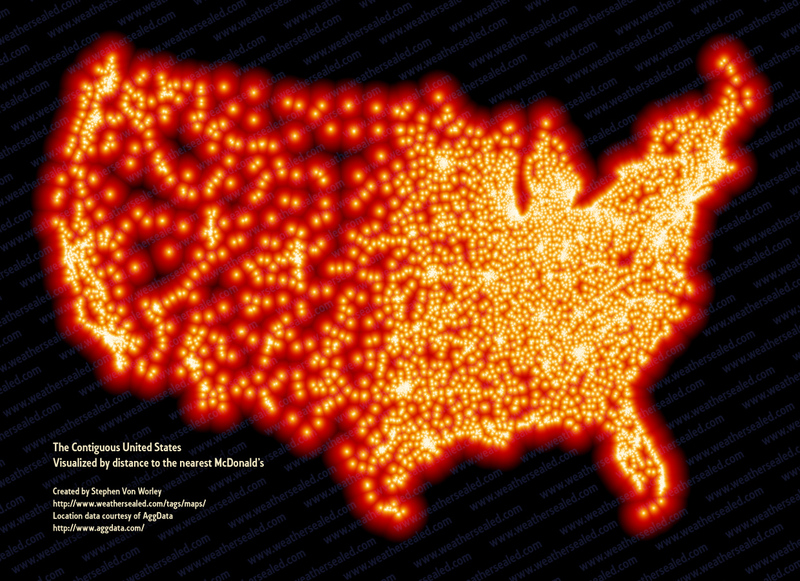 Eventually, someone would get it right - every McDonald's in the contiguous United States. Wow! That is a lot of McDonald'ses. They are everywhere. I really like the brighter spots that show you the locations of cities. You can see Raleigh-Durham, Greensboro, and Charlotte pretty clearly. Stephen Von Worley constructed this map in 2009 to demonstrate the our collective proximity to the fast-food chain. To be clear, the map has actually changed since then. Von Worley also determined the McFarthurest spot - the place on the map furtherest from any McDonald's. If you ever visit Glad Valley, South Dakota, you would have to drive about 145 miles to buy a Big Mac!